Yearning for the carefree life of a sheep owner, are we, Chris? Let’s just think this one through for a minute. Your mix of crabgrass and Bermuda grass is a good one, as it happens: Crabgrass continues to grow in hot summer weather when other grasses enter a dormancy period, while Bermuda grass can keep growing well into the autumn. Both kinds of grass come in assorted varieties with a broad range of growth rates: One sees figures between 6,250 and 13,310 pounds of dry mass per acre per year for Bermuda grass and anywhere from 1,000 to 12,000 for crabgrass. We’ll assume that 1. the grass you’ve got is in the middle of the pack yieldwise—maybe 6,500 lbs/acre/year for the crabgrass, 9,350 for the Bermuda—and 2. your yard is evenly split between the two types, meaning there’s an eighth acre of each. If so, your lawn could be expected to generate about 5.5 pounds of dry fodder a day. Since a mature ewe that’s neither pregnant nor nursing needs only 2.5 to 3 pounds of fodder daily, it’s reasonable to conclude that, yes, your yard might be able to provide for a couple of sheep. Of course this project won’t be a simple matter of backing the truck into the driveway and letting the animals hop out and do their thing. Once you’ve made sure your neighborhood is zoned for ruminants, you’ll have to sheep-proof the grounds, which means fencing off whatever vegetation you don’t want the sheep to get at, as well as identifying and removing any toxic plants that might be growing on the premises. You’ll also need some kind of shelter to protect the sheep from the elements. The next question is how many sheep you’ll need; the answer is two at a minimum. Though their famously low-key affect might suggest otherwise, sheep are gregarious creatures, and it’s unfair to ask them to work solo. (You may recall a 2001 study from the journal Nature in which British researchers reported that sheep shown photos of other sheep were able to recognize the faces of at least 50 individual animals; such sophisticated neural wiring, the authors argued, implies that ovine social life may be significantly more involved than we typically give it credit for.) It’d probably be best to start off with a pair of ewes and see how the lawn looks after they’ve grazed it for a while. To keep the grass suitably productive, you’ll have to make with the nitrogen fertilizer, a pound per acre every growing day. (The sheep, of course, will contribute some fertilizer of their own, which you’ll have to look out for as you enjoy your yard.) Meanwhile, the animals will need to be watered, receive mineral supplements, get sheared, have their hooves trimmed, get treated for worms and ticks, etc. Then there’s the issue of grass-length management. In general, the ag experts say, to achieve optimal yield, you want the grass to be no less than three inches long. 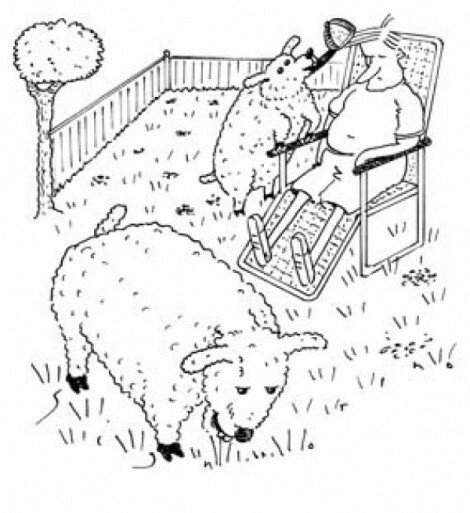 If your sheep make it shorter than that, you might need to team up with a few neighbors and shuttle the animals from lawn to lawn in 10-day shifts. Pluses include splitting your maintenance costs and providing the sheep with a change of scenery; on the other hand, now you’re looking at potentially contentious meetings of the sheep co-op board, which may not be what you signed on for. But it’s key to avoid overgrazing, where the sheep trim the grass down so far that it can’t regrow. This can become a particular problem as the weather gets cold—the grass stops growing but the sheep keep eating. At your latitude, you should count on maybe 120 winter-feed days a year, when your flock will have to subsist on hay or grain you’ve carted in. If all this labor saving is starting to sound like a lot of work, you can do what they’re doing in Turin—namely, enlist someone else’s sheep rather than buy your own, letting the owner handle all the expensive and time-consuming upkeep. Or you can opt for high-tech lawn care instead. The Swedish manufacturer Husqvarna makes a Roomba-style robotic unit that operates on a combination of solar and plug-in electric power; it’ll automatically trim the grass to a length of your choosing, periodically trundling back to its charging station as needed. Sure, you’ll be taking a big hit in the pastoral charm department, but I bet the tradeoff will look pretty decent on a February morning when you can sleep in rather than go outside and feed the lawn mowers.